At Erlanger Health System, our top priority is providing every patient the highest quality care at a price they can afford. We’re a full-service academic medical center that partners with the University of Tennessee Health Sciences Center. We offer care that is unmatched in the region, advocate for our patients and contribute to reforms that make healthcare accessible and affordable for our community. We will never deny medically necessary services to a patient. When scheduling an appointment at Erlanger our patient access team will work with your health insurance company to verify your insurance and eligibility. However, you may wish to verify this information with your health insurance company in advance. If so, follow the steps outlined below to see if your health insurance covers care at Erlanger. This is the best way to make sure your insurance company doesn’t deny coverage, reject a claim or refuse to pay for certain types of care. Your health insurance company also knows the details of your specific insurance plan and will be able to give you the best estimate of how much you will have to pay for care. When calling your insurance company, be sure to ask for the name of the person you speak with and call reference number for your records. Step 1: Look at your health insurance card to find the name of your insurance company, which is typically located at the top left-hand corner of your card. Step 2: Find the name of your insurance plan on the card. Step 3: Find your account number or patient ID number. Step 4: Call the customer service number on the back of the card. Step 5: Ask if your insurance plan covers your doctor at Erlanger. Step 6: Ask if the care and services you need are covered. Step 7: Ask how much you’ll pay in copays, deductibles and other out-of-pocket costs. Step 8: Ask if you need to get a referral from your doctor or preapproval from your insurance plan. 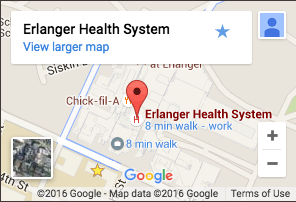 Step 9: Call Erlanger to schedule an appointment. Step 10: Share the information your health insurance company gave you when scheduling your appointment at Erlanger. We know health insurance can be hard to understand. That’s why it’s our goal to make it as easy as possible for you to get care at our hospitals, clinics and with our physicians. We may not accept health insurance from companies who have rates, policies, or procedures that don’t match our core values, quality standards, or the financial sustainability of our system. See a list of the insurance plans Erlanger accepts. Don’t have health insurance? See if you qualify for financial assistance or charity care.